Snacking my way into the weekend with these Dark Chocolate Cherry Energy Bites. 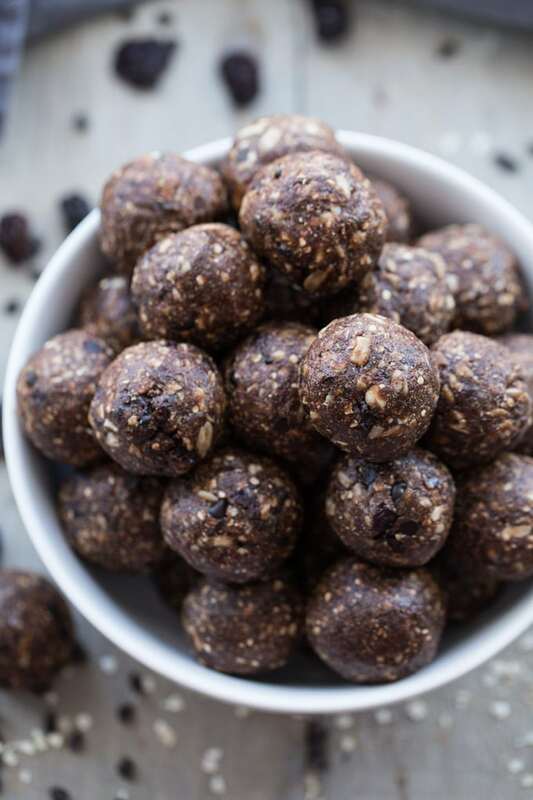 Nut-free, with sunflower seeds and quinoa flakes, these bites are super chocolatey and incredibly easy to make! And perhaps what’s more exciting is that February brings with it lots of food-related celebrations like the Super Bowl and Valentine’s Day. The month of savoury snacks and sweet treats is here! To be honest, if it wasn’t for my husband, I probably wouldn’t know it was this Sunday. I “watch” the Super Bowl every year with him, but I’m in it for the food and the show. Sadly, I continue to know next to nothing about football! But snacks? I know my snacks! For certain, I’ll be whipping up this hummus for Sunday’s festivities, and maybe even this vegetarian chili (which will double as my lunch for the week!). And for a healthier treat, I’ll have a batch of these Dark Chocolate Cherry Energy Bites ready to go. If you’ve been following along for a while, you may have noticed I have a slight obsession with energy bites. While I have a few different recipes on the blog, chocolate hazelnut bites are probably my favourite, followed closely by these baked pineapple coconut bites. But all of my energy bites contain nuts and nut butters, and with so many people experiencing nut allergies these days, I felt inspired to create a recipe that was nut-free. And that’s how these Dark Chocolate Cherry Energy Bites came to be! 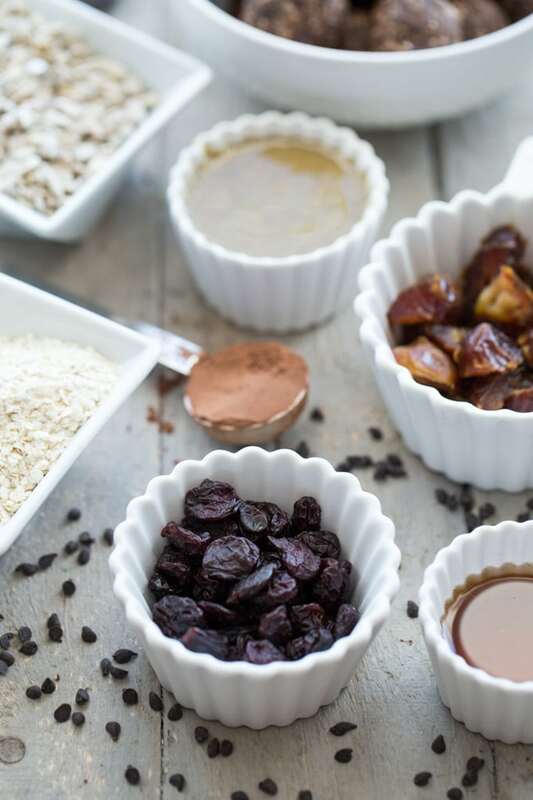 All you need is a food processor and some key ingredients like medjool dates, dried tart cherries, sunflower seeds, sunflower seed butter, quinoa flakes and cocoa. These bites aren’t overly sweet, but the hint of cocoa and the tart cherries totally remind me of a black forest cake. And they include lots of clean eating ingredients, so they make a great mid-day snack or post-supper treat. 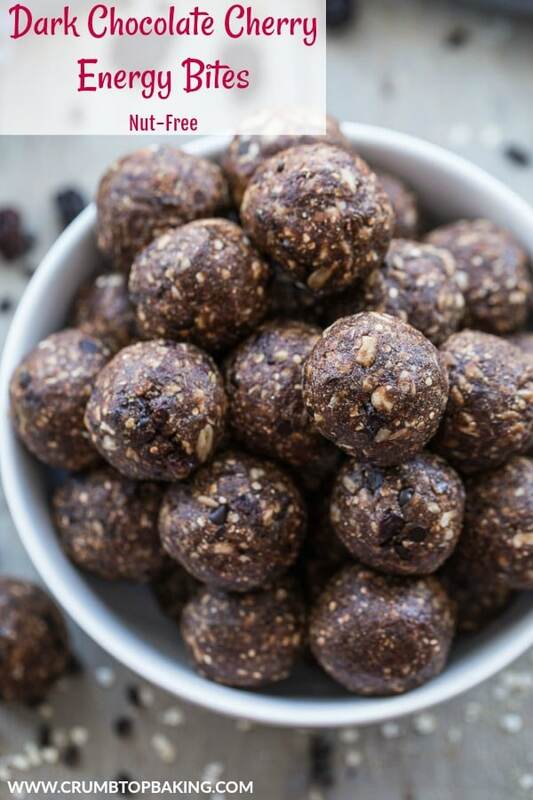 If you make these Dark Chocolate Cherry Energy Bites be sure to leave a comment below and let me know what you think! Or take a photo and post it to Instagram. Just be sure to tag @crumbtopbaking so I see it! 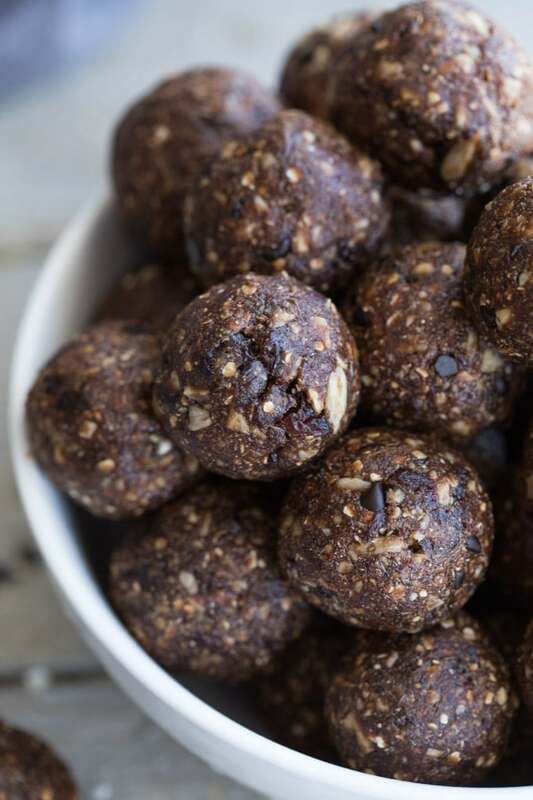 Made with sunflower seeds, quinoa flakes, seed butter, dates and cocoa, these Dark Chocolate Cherry Energy Bites are nut-free, chocolatey and super easy to make! In a small dish, combine the chopped dates with the hot water and vanilla and let soak for 20-30 minutes. Add the date mixture (including the liquid) to a food processor, along with all the other ingredients, except the chocolate chips. Process on high until well combined but with some chunks of seeds and cherries remaining. This should only take a minute or two. You may need to stop the processor a few times to scrape down the sides or break apart the mixture. Add the chocolate chips and pulse for a few seconds. Roll the mixture into 12-14 balls. You can eat them right away or place them in the fridge to firm up a bit! The energy bite mixture will be sticky, so you may need to rinse your hands with warm water a few times while rolling them. Ooooh! So many tasty ingredients in one little ball. I need these in my life! Thanks Jo! There is definitely a lot packed into this bowl! Happy weekend! Ah, I will have to try this recipe. I have bought a package of dates and my midwife told me that I was supposed to eat 5 a day. 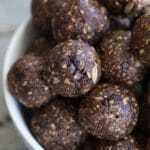 Energy bites seems more appealing than eating straight dates! Plus, dark chocolate. Who can say no to that?!? Oh my!!! These sound spectacular! And I am definitely going to check out your Pineapple Coconut Bites as well, those flavors are some of my favorites! Thanks Redawna! Hope you get a chance to check out the pineapple coconut bites too! Happy weekend! These dark chocolate cherry energy bites look awesome! I’ve been thinking I need to make something like this for snacks while at work. I am the same way about football, I really don’t know much about the sport, but my boyfriend doesn’t really follow it either so I’m able to get away with it! Hahah. Have a great weekend! I make energy bites all the time for a quick snack during the week. They make a great after supper treat too! Glad I’m not the only one that doesn’t follow along with football! Have a great day Vanessa! 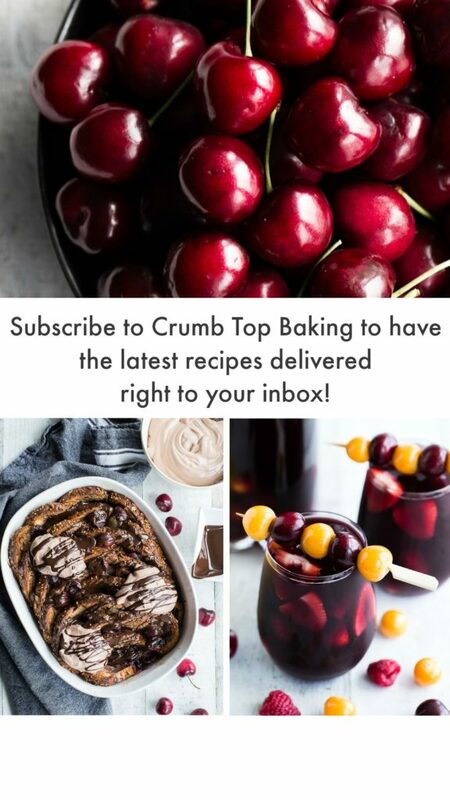 I love the classic combination of chocolate and cherries! These look absolutely delicious! Thanks Marissa! I love the combo too! Happy weekend! Oh goodness. I want that entire bowl! Thanks Lily! It’s definitely easy enough to eat more than one! Yummy! These energy bites seem like a perfect breakfast idea to get me go through the day, Leanne. Can I use agave syrup instead of a maple one? Thanks Agness! I’ve never used agave syrup before, but if it has the same consistency as maple syrup it should work as a substitute. Let me know if you try it! I’m a huge fan of energy bites too Michelle! I hope you like the combo. If you make them, be sure to let me know what you think. Thanks for stopping by! I’m definitely watching the Super Bowl today and just hope it’s a good game! Last year’s was a sleeper. 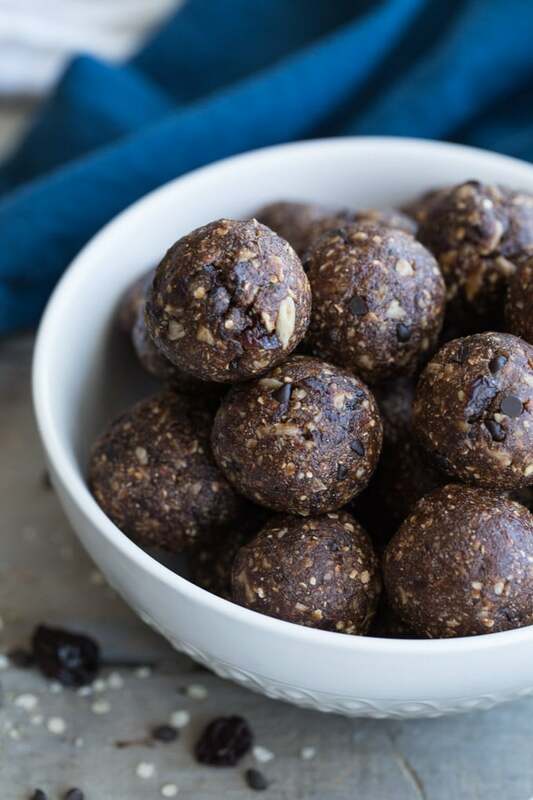 These energy bites are right up my alley — I love the chocolate-cherry combination! Thanks Marcie! I totally agree. Chocolate cherry is a great combo! Hope you enjoy the game and the rest of your Sunday! Oh yum! Definitely making these for Valentine’s Day! Thanks Helene! Hope you like them! So, I watched the last 20 minutes of the Superbowl! Haha, enough to see the excitement of the winner I suppose. I love that you made these bites nut-free! I make a lot of energy bites as well, but always with nuts too, and then I can’t pack them in my son’s pre-school lunch! I’ll definitely be giving these a go!! Pinned! The Super Bowl was on but I can’t say I was watching it closely! But I did enjoy all the snacks! Thanks for pinning this one Katherine. I love that they are nut-free too! Hope you get a chance to make them. They’re definitely perfect for school lunches! I don’t freakin’ understand football, like, at all. And, what’s up with all the starting and stopping? The half time show was pretty good, but seemed like the sound was off a bit. Anywho – I love energy bites and this is such a classic combo! Have a wonderful week, Leanne! Thanks Dawn! These energy bites are a staple in our house these days! And I totally agree about football. I don’t understand much about the game, but I enjoyed the half-time show! Have a great week! Hi Leanne, I love the combination of dark cocoa andtart cherries, and am a huge fan of black forest cake. Just recently I did some reseach on quinoa and was utterly floored at how amazing this seed is or grain if you want is. Your flavors of the dates and the sunflower seed sound divine and I can only imagine the dance with your tastebuds that goes on when you pop one of these in your mouth. This is a great healthier snack, great to keep the energy alive for cheers, sudden leaps in the air, screams of shear delight, as your favorite team hits the end zone, lol. Thanks Loreto! I love the cocoa and tart cherry combo too. And isn’t quinoa the best?! I add it to so many baked goods and savoury dishes. So versatile and filling. Hope you have a great week! This is absolutely on my todo list. I was actually searching for a good nut free energy bites. I know my daughter will love the chocolate flavor. Thanks! I hope you get a chance to make them Hee Jee! And be sure to let me know if your daughter likes them! Thanks Puja! I hope you like them. Have a great week! I’m thinking ahead to spring too Leanne! These little bites look like they’d hit the spot after a workout or as a little afternoon pick me up. Love the chocolate cherry combo! Thanks Mary Ann. These are definitely a nice post-workout snack. Not too sweet but filling! Happy Wednesday! Ooooooh momma! I love date based energy bites but I’ve never made them with cherries! Brillant idea! Your photos are awesome and this recipe looks and sounds utterly fantastic! Thank you! 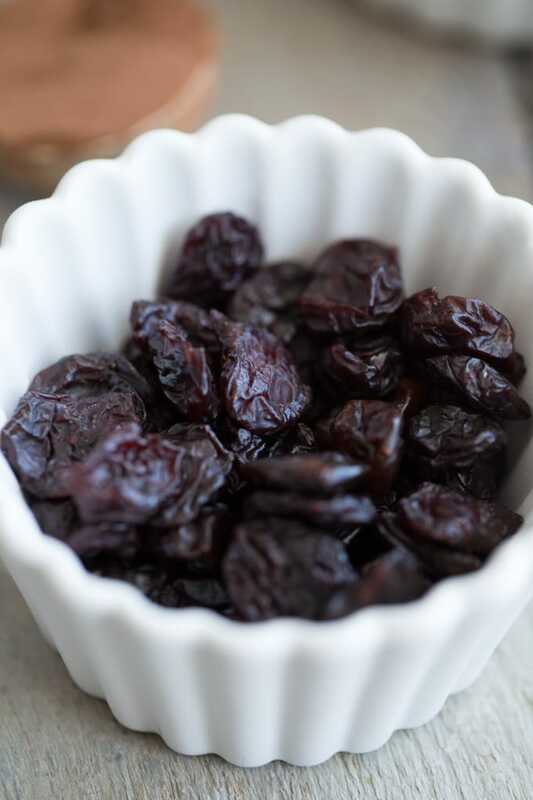 I love all things dates, so they’re a must for me in most energy bites! The tart cherries in these bites definitely add a little something different. Have a great weekend Christina! We are definitely closer to the start of spring than the beginning of winter, so I’m all for the positive outlook!!! And the spring veggies! These bites look delicious!! I could always use more energy, especially when it comes in a tasty treat like this! Yess!! Cheers, girl! Love your positive attitude Cheyanne! So happy we are closer to spring than the beginning of winter! Happy weekend! I LOVE football, but I get just as excited for Super Bowl snacks as I do for the game :). These little bites of yumminess would have been perfect on Sunday but they’ll be just as delicious this weekend when I’m mourning the end of football season instead of actually watching a game, haha! i love chocolate + cherries (cherry garcia ice cream is one of my favorite flavors!) together, so i bet i’d love these too (: and haha i think i saw a combined minute of the superbowl between the peaks i got while out for lunch at a poke place and playing games at an arcade.